Christine Watkins grew up without religion and without a belief in God. Her parents had told her that Jesus was a fairytale and that when you died you became part of the dirt and helped nourish plants. As an adult, she searched in vain for some shred of hope and direction. She explored all sorts of New Age practices and followed the advice of a psychic that led her nowhere. Meanwhile, her promiscuous lifestyle had ravaged her body, leaving her afflicted with cervical cancer. It was at this point that God intervened in her life. Her friend Joseph reached out to her, helped her to pray, and taught her about God. Jesus even cured her of cancer. She completely reformed her life. She earned Master of Theological Studies and Master of Social Welfare degrees and became a spiritual director, bereavement counselor, inspirational speaker and retreat leader. She also developed a deep relationship with Mary as a result of a pilgrimage to Medjugorje. “Full of Grace” is not for the faint of heart. The subject matter includes children dying in the sewers of Columbia, drug abuse, and strippers. The stories, however, have the power to change lives. They show the ability of God to work in the midst of the most horrible situations. 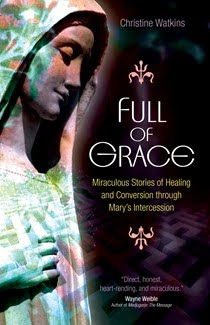 As Watkins states, “In telling their stories, these ordinary people opened the door to their extraordinary lives – to a view more fantastic than fiction – and showed how God lifted them into his loving arms, often out of a living hell, and raised them up to the heights.” Each of the stories is followed by questions and a faith exercise, useful for personal reflection or in a book or prayer group. This chaplet comprises seven groups of 4 beads each: A meditation bead, and three smaller beads on which are said Our Father, Hail Mary, and Gloria. Holy Mary, who unties the seven knots, full of the presence of God during your life you accepted with great humility the Holy Will of the Father and the legacy of your Son, Our Lord Jesus Christ. Evil never dared to entangle you. Together with your Son, you interceded for our difficulties, and with simplicity and patience, you have taught us how to undo the knots that entangled our lives. By being our Mother, you smooth and make clear the ties that unite us to Our Lord. Cover us with your protective mantle and permit us to experience, in your loving and maternal protection: Peace, Harmony, and Purity. Holy Mary, Mother of God and ours, with your maternal heart undo the knots that entangle our lives. We ask you to receive in your hands ( mention who or prayer request ) and liberate us from these entanglements. Blessed Virgin Mary, through your grace, your intercession, and your example, deliver us from evil and untie the knots that obstruct our unity with God, so that we may find Him in all things, have Him in our hearts, and serve Him always. legacy of your Son Our Lord Jesus Christ. October has long been the month dedicated to the Rosary. Pope St. Pius V established the feast of Our Lady of the Rosary (October 7th) in 1573 to thank God for the victory of Christians over the Turks at Lepanto, a victory attributed to the praying of the rosary. Pope Clement XI expanded the feast to the universal Church in 1716. The dedication of the entire month to this devotion was officially established by Pope Leo XIII in 1884. While devotion to this prayer form waned a bit in the years immediately after Vatican II, interest in this long-practiced devotion is experiencing a resurgence as the faithful rediscover the beauty and spiritual benefit of this meditative practice. The name “rosary” comes from the Latin “rosarium” which means “rose garden.” A rosary is widely considered a gift of roses to Our Blessed Mother in heaven. The rosary has had a long history and gone through many stages of development. The use of prayer beads actually precedes the time of Christ. Hindus used them to help keep track of prayers said throughout the day. In the Christian tradition, early monastic orders would pray the 150 psalms daily. At first they would use 150 pebbles in a small pouch in order to keep track. This later developed into a string with 150 knots and finally a rope with 150 wooden beads. Members of the laity who did not necessarily know the psalms by heart wanted to have a comparable version of this practice and so the tradition of praying 150 “Our Fathers” each day was born. A similar string of beads was used to keep track of this as well. In time, the “angelic salutation” of Gabriel was added before each “Our Father”: “Hail Mary, full of grace, the Lord is with you.” Later on, Elizabeth’s greeting was added to this: “Blessed are you among women.” Still later, the prayer of “Holy Mary, Mother of God, pray for us sinners now and at the hour of our death” was added and the “Hail Mary” as we know it was developed. Meanwhile, in the year 1214, Mary appeared to St. Dominic and encouraged him to spread devotion to the rosary. She promised him that if he did so, he would be successful in converting the Albigensians and that his religious order that he founded would prosper. He spent the rest of his life encouraging others to pray the Rosary and founded a Rosary Confraternity to aid in this task. One hundred years later, Blessed Alan de la Roche picked up where Dominic’s work had ended. He divided the rosary into 10 “Hail Mary” decades preceded by the “Our Father.” In the 15th centuries, the mysteries of the rosary were assigned to each of the decades. This gave people an opportunity to reflect on Scripture while offering up this meditative prayer. In 1917, Our Lady appeared to three young shepherd children in Fatima, Portugal. She declared herself to be “Our Lady of the Rosary” and repeatedly urged the children to recite the rosary daily. A “scapular” was originally a type of clothing worn by monks when working. It fit over the shoulders and covered the front and back. The Carmelites were one such group that wore this vestment. Over time, and in light of the apparition of Mary, the scapular became a sign of trust in Mary as well as commitment to Christ. During the middle ages, groups of lay people began to become affiliated with the monastic orders. The orders in turn wanted to give these lay people an outward sign of that affiliation. For the Carmelites, a smaller version of the scapular was developed and worn. •	It stands for a commitment to follow Jesus, like Mary, the perfect model of all the disciples of Christ. This commitment finds its origin in baptism by which we become children of God. •	It leads us into the community of Carmel, a community of religious men and women, which has existed in the Church for over eight centuries. •	It reminds us of the example of the saints of Carmel, with whom we establish a close bond as brothers and sisters to one another. •	It is an expression of our belief that we will meet God in eternal life, aided by the intercession and prayers of Mary. Investment with the scapular requires a priest or deacon to place a blessed scapular over a person’s head while reciting a prayer to Mary such as the Hail Mary, Hail Holy Queen, or Memorare. Investment must be done with a cloth scapular, although after that time, the wearer may choose to wear a blessed metal scapular instead. O Most beautiful flower of Mount Carmel, fruitful vine, splendor of Heaven, Blessed Mother of the Son of God, Immaculate Virgin, assist me in this my necessity. O Star of the Sea, help me and show me herein You are my Mother. In the quiet of night, a young mother holds her baby to her, admiring his fingers and toes, exploring the features of his face. Her son is new to this world, a gift from God. She is like every other new mother, filled with wonder and exhaustion and, perhaps, fear. She is very young. Is she up to this awesome task that God has seen fit to entrust to her? After all, this is no ordinary child. His birth was foretold by the prophets. An angel came to tell her he was coming! She replays the vision in her memory. It was just an ordinary day when the angel came with his divine message. Do not be afraid, Mary, for you have found favor with God. Behold, you will conceive in your womb and bear a son . . . He will be great and will be called Son of the Most High. (Luke 1:30-32) Fear not? A child? It had been a lot to take in, but she believed, she trusted, she said “yes.” From that moment, nothing would ever be ordinary again. She had gone to her cousin Elizabeth to help her with her own miraculous birth. She had returned home to begin her life with her husband, Joseph. Then, heavy with child, she had to travel to Bethlehem. Now, she had just given birth among the animals, far from her family and friends. This really wasn’t what she had in mind. Yet, she is thankful. The innkeeper was kind to let them stay here. They are safe, they are warm, and all went well with the birth. She smiles at her child. He is perfect, so perfect. If only her mother could be here to see him. He is the One her people have waiting for: The Savior, the Messiah, the Promised One. These are such big names for such a tiny baby, her baby who sleeps so peacefully in her arms. My soul proclaims the greatness of the Lord; my spirit rejoices in God my savior. (Luke 1:46-47). Who are these strangers who have come to visit? Joseph is talking to them, inviting them in. He whispers to her, “The angels told them.” She nods. This baby is special. The secret that few had known is secret no more. She resists the urge to hold him tighter, keep him to herself. He is not just her baby. He belongs to the world. She lays him in the manger so that they can take a closer look. They tell her about the angels, too. The light was so bright!There were so many! The whole of heaven was rejoicing!Glory to God in the highest and on earth peace to those on whom his favor rests. (Luke 2:14) The shepherds stay for a little while, and then they return to their fields. She can hear them praising God as they leave. Joseph looks kindly at her, then lays down to get some rest. She should rest, too. It has been quite a day! But, her mind will not quiet down. There is so much to think about. She checks on the baby again, makes sure that he is warm and dry. She remembers the shepherds looking at him. They had such reverence in their eyes. They knew that they were beholding a miracle. Yes, a miracle, a miracle entrusted to her care. She thought of the future, of all the things that he would need to learn. Yes, there was so much to think about. That young girl who had been living a quiet life before the angel came no longer existed. She was a mother now, the mother of the Savior. All ages will call me blessed. (Luke 1:48) Why did God choose her, out of all the girls in all the world during all the ages? Why her, a simple, poor girl? Why did the savior come as a baby? He could have just appeared in glory. Why come in such impoverished conditions? It didn’t make much sense to her, but she knew that God must have his reasons. She would continue to trust, to hope, to believe. She would continue to say “Yes” wherever the road would lead. This baby would not only change her life. He would change the world. She is tired. She closes her eyes and dreams of the future. Yes, this baby would change everything.